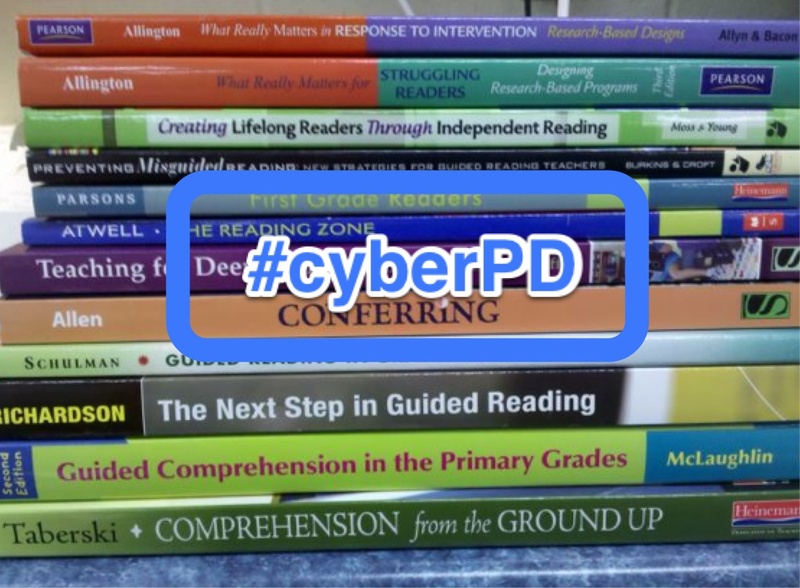 I found the summer #cyberPD posts last week on Reading in the Wild. 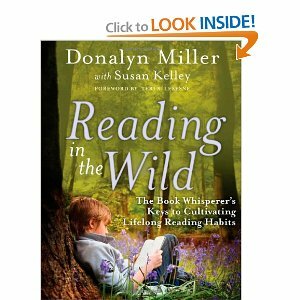 These posts added so much to my take on Donalyn Miller’s book. It offered insights above and beyond my initial thoughts. Reading those comments inspired me to reread and join in. Thank’s to Cathy Mere at Reflect and Refine, Laura Komos at Ruminate and Invigorate and Michelle Nero at Literacy Learning Zone for hosting this. .Here is the schedule I “lifted “off of Cathy’s blog. Comment on the host blog. Tweet comments using #cyberPD hashtag. I read RIW over Winter Break, loved it and blogged about it here. . We created the graffiti wall, did more book talks and recommendations. Interestingly, what I thought I understood about wild readers has adjusted since the first read. I didn’t get the urgency or necessity of nurturing wild readers in the classroom. Now I get wild readers are readers for life, not just kids who can read in my classroom. Today I offer my current take aways from Chapters 3 and 4. A reading community in Donalyn’s world is tribal; it’s personal. She talks of bottom lines and asks us to come up with our bottom line. She tells her students, “you are my people.” In other words, I understand you and you understand me. We seek the same. There is respect for and expectations of the individual and the community in that statement. It says we value each other and each other’s opinions. As much as I hope to change children’s lives, my relationships with students transform me. I want my students to remember our classroom as a home that they may leave, but it will never leave them. They are forever mine, and I am forever their teacher. We need to show we value reading with our actions, by being readers, sharing our reading publicly and honoring others who do the same. Reading doors throughout the school would be amazing, but I’m imagining rmore. We currently display student writing. How wonderful if we could display top reading picks of classrooms alongside our writing. Wild readers make plans. This weaves so beautifully into the previous chapter on community. Book recommendations from our community keep us going! I had no idea how powerful that really was until I started connecting on Twitter.and blogs. One recommendation leads to another. Of course you let the person who recommended it know how much you loved it, and the cycle continues. All of a sudden you get caught up in the fever and your stack never diminishes, but neither does your desire to read. I hadn’t really thought about how important this rather simple idea is. By having that next book, waiting and someone like you who told you’d love it, you are set up, almost obligated, to get to that book. There is no down time! This matters for our students they can’t afford to miss any reading time. We need to develop a culture in our classrooms of planning, and being on the look out for the next read. Students must learn how to make their own reading plans, reflect on their individual accomplishments, and find personal reasons for reading or they will never become wild readers. Explicitly teaching students how to plan and then reflect thoughtfully on what worked and what didn’t work is crucial. This struck me as a powerful way to honor all readers on their path to becoming wild readers. By planing and adjusting our plan based on what we did, we learn from our hits and our misses.. Aim for commitment and challenge in personal reading plans. Goals and personal challenges should be managed for success. Once we meet a goal, we make the challenge a little greater. We should build from strength..The shorter reads at the beginning of the year or with more fragile readers is so smart. And note to self: More Series Books! These books provide both commitment and challenge as well as familiarity. They take our a lot of that uncertainty and could help us push ourselves to more complex work. When reading is relegated to the time allotted at or by school, we are settling for less than what kids need. This type of reading may produce people who can read, but not necessarily people who want to read. Students who read on an inconsistent basis never develop an attachment for reading. Those who read only at school remain vulnerable if they don’t invest in reading at home. As a school community or classroom teacher we can’t control what happens at home, but perhaps our stance in how we approach, model and provide reading opportunities in school needs to change. As long as students are reading for school, they will simply do that. If students are setting and reflecting on their reading challenges throughout the year, summer time slump will not be an issue. They need to leave our classrooms capable and ready to find, read, and find more reading. If they can do that with out our assistance, they are reading for themselves and on the road to becoming wild readers. Your final paragraph is very powerful, Julieanne-love the doing all we can as teachers & sending students off as capable, wild readers! I think you do have a slogan: “where we put our money speaks volumes”-love it! I’m glad that you changed your own stance after re-reading the book. There is more to it as Donalyn says than just having a wonderful experience in one’s class. We want them to continue that time all their lives! I struggled writing this because so much intertwined in my head. It was important to process through though. Now to hold onto it and make it a part of me that is the trick! ing lives as much as we validate and “publish” their writing lives? Linda Rief writes about her students’ “portfolio wall” – where reading and writing endeavors are equally displayed. This is something I really want to invest time and energy figuring out, too. Thanks Tara, to write it one thing to make it happen in the classroom, that’s the hard part. Thanks for reminding me about that portfolio wall of Linda Rief. Going to go back and think on it. I know it’s low tech, but remember those old Poloroid cameras. Can you imagine snapping a pic with your favorite reads — quick and easy and up on the wall. Julieanne, I have to agree with everyone who has commented above as well! That last paragraph is the essence of RitW. You have many of the same ideas as I do for my 5th grade readers. Great to find others out there that share common views. After reading the chapter on Reading Plans, I began to reflect on how I try to encourage students to set reading goals. We use a “Someday List” and we share book commercials to add to our lists. I also promote reading challenges like our Book Over Break Challenge and our Summer Reading Challenge – read 10 by the 10th. As Donalyn said, these “school-based reading measures often impose external reading goals on students: required reading assignments, fluency targets, reading logs…” And like you said, students will simply read for school. How do you encourage students to develop internal reading goals? What is happening in your classroom? Suggestions? I struggle with the internal goals. Very few just have it. I don’t know if that is due to how we have been teaching them over the years to get the grade, to grow in reading level. That is what they seem to be trained in when they get to me. Read Aloud is the time when all students love the book for the reading experience so I try to transfer that experience into their independent reading lives. The best work has been when they work as clubs on the same book and actually read aloud together, discuss problems they are encountering together, or disagree with an idea. We spend one day a week (sometimes every other week) recommending books to each other. Book lotteries are big. Kids want that book. I had big success with blogging with our writing. I love the idea of Michelle Nero’s of book commercials to be shown school wide. I’m not sure how tech could work on that. Perhaps a private youtube channel. I have made some progress but the real ownership of plans that live outside the classroom is still a dream. Thanks so much for responding. Love to connect with like-minded souls. Like you, I think I’ve learned my lessons of community and having a plan from Twitter. When I think of my #epicenterreaders, most of them are from Twitter. These friends share book titles I know I will want to read. They never steer me down the wrong path. Because I want to join the conversations, I continue to read one book after another. I want my students to find that community that can connect them to their next read time and time again. At the beginning of your post you said this about #cyberPD, “It offered insights above and beyond my initial thoughts. Reading those comments inspired me to reread and join in.” I have been amazed at the power of this professional development. Each year the community grows. I always know that I can come back to this circle across the year as I try to make changes which result from these conversations. I’m so glad you decided to reread and join the discussion. I would not be the teacher or person I am today without the connections I’ve made with people like you and this community. Thank you so much for this opportunity. It is a life changer with broad reaching impact. Love your wording of “public displays of book love” – fun! As someone who implemented some of these ideas before, what do you most want to change to encourage that sense of urgency? I’m so excited that you jumped in, decided to reread the book and share your thoughts! What I love even more is that you have learned more the second read and through the online discussions. I love when our thinking is constantly pushed forward! Community is the heart of cultivating wild readers. Wild reading cannot thrive without it! As Donalyn states, “Reading drives everything we do.” (p.88). One idea that I will take away to help continue to build a school-wide reading community is the “top reading pics” from the classrooms. What a great way to share books throughout the school! More public displays of book love! I love this idea: “More social opportunities surrounding books.” This got me thinking of some ideas, but I’m curious what you were thinking … We definitely need more opportunities and include parents and families. I thought your explanation of the never ending cycle of book recommendations was spot on! The fury of book talk (#bookaday, #titletalk, Goodreads sharing, etc) that happens on twitter is exactly what we need to recreate in our classrooms. That constant buzz of title talk that excites the room! One BIG takeaway: a goal could be a commitment to read. As a reading specialist providing interventions to developing readers, the challenges may be too challenging, but I love the commitment plans! Thanks again for sharing your thoughts and joining in our conversations! get students to create reading clubs around their own interests, maybe even advertise for members and make it their own. Lunch and breakfast clubs could feature food. Students love read aloud so perhaps teachers could offer special read aloud groups at lunch. My kiddos love skype. So I’m thinking about connecting with other classrooms or authors once a month for the lunch time groups. Monthly public library visits that feature a trip to the ice rink next door. I figure we’ll try out things, get student input. and adjust –the goal being to create student centered reading outside of class. Thanks for your response! Love all of these ideas!! All of them will continue to create the book loving reading community! Can’t wait to hear more in the coming school year!